Location Аквариум Варна | Imprint.BG - the only producer and operator of the popular souvenir machines for Bulgaria. The machine is placed to the right of the pay desk. The Varna Aquarium is a public aquarium in Varna, Bulgaria's largest city on the Black Sea coast. The aquarium's exhibition focuses on the Black Sea's flora and fauna which includes over 140 fish species, but also features freshwater fish, Mediterranean fish, exotic species from faraway areas of the World Ocean, mussels andalgae. Today, the aquarium's research unit, the adjoined Institute for Fish Resources, includes 12 scientists who conduct research related to hydrobiology, hydrochemistry, marine microbiology, ichthyology, plankton and benthos. 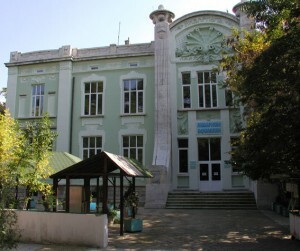 The Varna Aquarium's library houses 30,000 volumes of specialized literature, including rare 19th-century books and maps.